On behalf of Bryncoch Action Committee I would like to thank everyone who has supported us in raising the magnificent total of almost 2700 objections. We would like to express particular thanks to those people who live outside the immediate area and have taken the trouble to object to the development. It has been a crash learning process for the committee, at times frustrating, as we have struggled to understand exactly how the system works and where information can be obtained. With much assistance we have been able to produce a detailed Objection Dossier which we presented to the Authority on August 2nd - the closing date for Objections. The Dossier will shortly have available on this website, please check it out over the next few days. Having completed the work to prepare the objection, the committee is more convinced than ever that this area of land, for Ecological and Historical reasons, should not be developed. Local volunteers gave their time freely to undertake the Traffic Census at the Cadoxton Road roundabouts which shows a significant increase over the Jan 2005 census. You will be able to read in the Dossier the interpretation of these figures. We believe this clearly demonstrates that building further houses in the vicinity of the A474 will exacerbate what is already a serious problem. From the outset we, as a committee, took the view that the removal of ANY land from the Green Wedge was unnecessary and unwise. We also took the view that we were not in the business of identifying another site for development but would object to removal of ANY land from the Green Wedge. This position was regularly stated at our Public Meetings. That still remains our view and we are convinced there remains enough brownfield land available for development within Neath Port Talbot. We understand that some of our supporters have been dismayed by coverage of a Social Market Foundation report covered in National newspapers on Wednesday of this week. I would draw your attention to two quotations that may help allay fears. Niel Sinden, Policy Director of the CPRE , described the report as ‘a simplistic exercise that is dangerously flawed ..... it seriously underestimates the amount and capacity of brownfield land available for housing and fails to recognise the benefits of green belt controls’. The committee reaffirms its commitment to protection of ALL Green Wedge land in Neath Port Talbot. 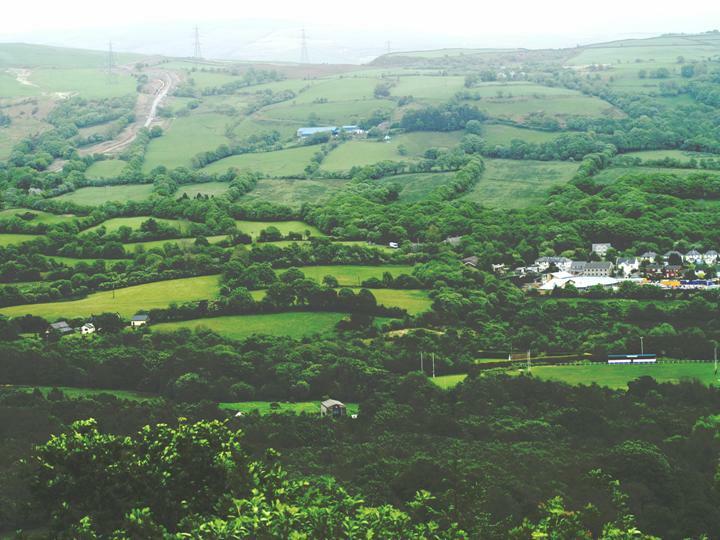 Below is a photograph of the Farm - the proposal is to build on 5 fields of pasture adjacent to the old Farm house - to the left of the new Ysgol Hendre school in the centre of the photograph. The photograph was taken from the old quarry above Dyffryn Farm.